Want to be the first to know about new designs and sales in the future? Sign up below! All items from BellaBejeweled arrive beautifully wrapped and ready for gift giving or safe keeping. Standard shipping is via USPS First Class, and we are happy to ship anywhere in the world! Want special shipping services or have a question? Feel free to email us and ask! Want to rush your package for a special event? Can do! Click here for details. 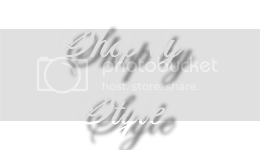 What you are buying is a wearable work of art! We take pride in each and every one of our pieces, no matter how big or small. All the jewelry you see here is made with the highest quality workmanship and materials, and comes with a Lifetime Quality Guarantee. If your BellaBejeweled jewelry EVER bends, breaks, or gives you other trouble due to normal wear and tear, just contact us and we'll fix it or replace it for free! Your happiness is our priority. We want your experience here to be 100% positive, and your pieces to become a valued part of your wardrobe for life. Buy with confidence at BellaBejeweled - You won't find better made jewelry, and that's backed with a guarantee! Eclipse, Kristen Stewart Win Big @ People's Choice Awards! 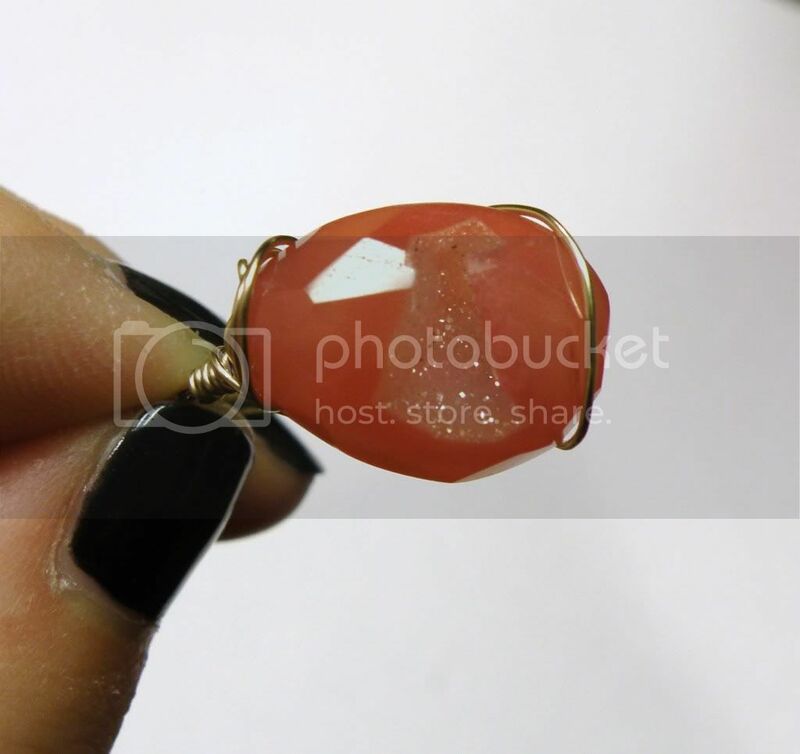 This one-of-a-kind ring features an absolutely gorgeous faceted nugget of juicy grapefruit pink chalcedony, lined with a pocket of glittering druzy crystals. These naturally-occurring crystals pack a serious visual punch, with tons of facets that sparkle and shimmer from every angle! No two stones with druzy are alike. 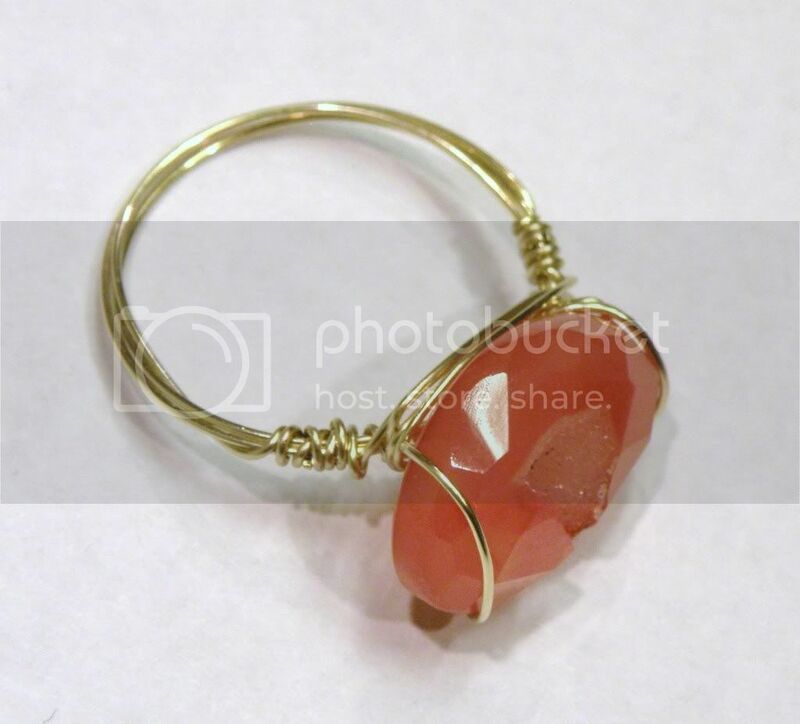 Perfect for the holidays, this gorgeous piece is wire wrapped in 14k gf wire to create a size 9 ring. The contrast in colors is fantastic. Expect to turn a few heads wearing this one! Sorry, this ring has sold! Wishing for something similar? Why not request a ring custom-created in your size, just for you! Email us now for details. Love Twilight? Love Makeup? This is for YOU! I know this site is all about jewelry, but I wanted to take a moment to tell you about an exciting opportunity with another of my favorite pampering products - makeup! My friend Rae at Mixology Makeup is running a fantastic contest right now, and we want to invite YOU to become a part of it. 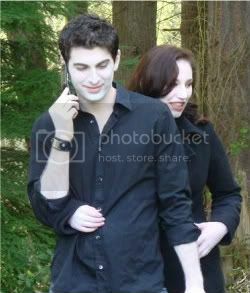 All you have to do is head on over to http://mixologymakeup.etsy.com and get your Twiology character makeup kits. At just $2 (to cover the cost of supplies), these kits come with tons of high quality mineral makeup to create your Twilight-inspired glam. Play with the look until you've perfected it, snap some photos and send the best ones on over to Rae as your official entry in the contest. This is one opportunity you DON'T want to miss! Winners will not only be the official face of a Twiology Makeup collection for at least one year, but you'll also win amazing prizes such as jewelry from yours truly, character inspired fragrances from Essence of Twilight, and a tons of other awesome prizes! Swingy and fun! These gorgeous, flirty earrings were inspired by the always overcast, misty, stormy weather that provides the setting for the Twilight saga. Set on oxidized sterling silver, this unique design features spectacular, step-cut twist labradorites. I absolutely love this unique cut! 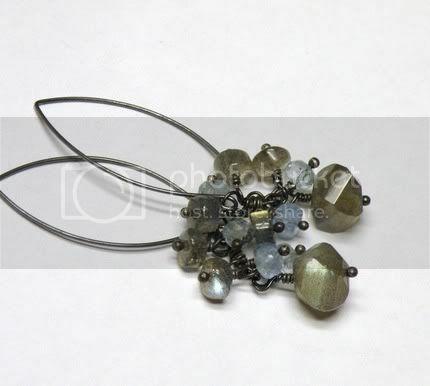 The sparkly twists are accented gorgeously by smaller, flashy labradorites and sparkly aquamarines. 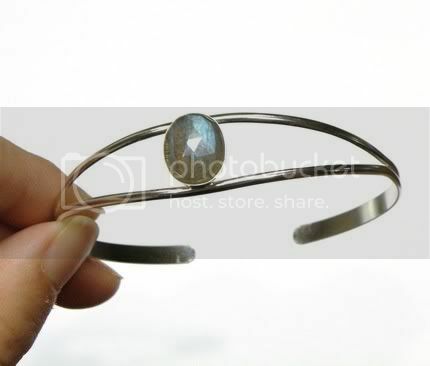 Labradorite is a beautiful gemstone, with a speckled, softly glittery texture and flashes of blue and green. The facets and flashes on these pieces look so much like lightning to me... Gorgeous! 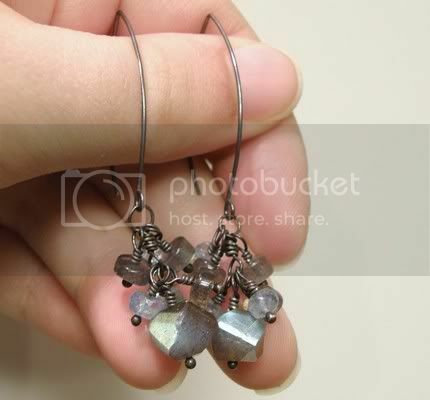 The earrings are handmade using solid sterling silver and genuine gemstones. Flirty and fun with lots of swing, you get tons of sparkle and colorful flash with every movement. The earrings look amazing with jeans and a tshirt, or spruce them up with a cute cocktail dress! You just can't go wrong with these quirky yet classy gems. This is a limited edition design - If you love them, grab them while you can! Sorry, this design has sold out! Wishing for something similar? 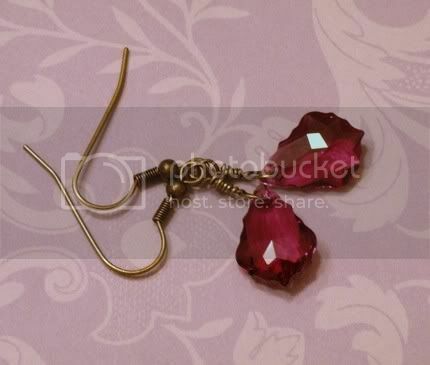 Email us and request a custom pair of earrings inspired by these! 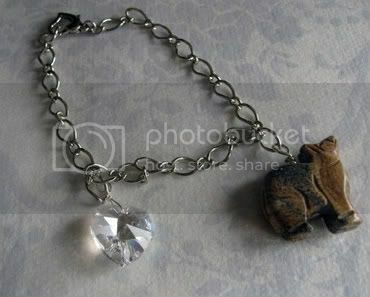 Ultimate Bella Charm Bracelet, Twilight Inspired Jewelry - Hand Carved Wolf and Swarovski Moonlight Heart - As Seen in the BCP Music Video, Let It Go! And be sure to check out all of Forks University's amazing productions! The Bella Cullen Project chose the best, and so can you. Get this original BellaBejeweled design, and don't forget to share the music video with your friends! This bracelet consists of a lovely rhodium plated chain, which closes with a delicate heart shaped lobster clasp. Rhodium, part of the platinum family, is beautiful, durable, and tarnish resistant to keep its shine for years to come! A hand carved howling wolf (carved out of a jasper stone, with natural wood-like striations) and a 14mm Swarovski Moonlight heart balance each other beautifully. Just like the carved wolf from Jacob and the diamond heart from Edward, it's the most authentic and beautiful Bella charm bracelet available! 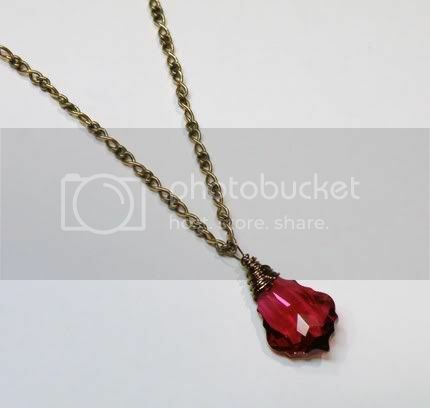 After tons of requests, I am happy to bring you the BellaBejeweled version of the necklace Bella wore to prom in the Twilight Movie! 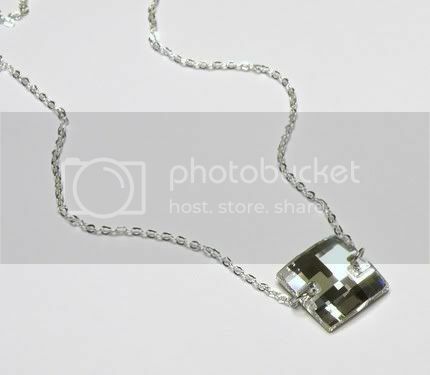 A large, incredibly sparkly Swarovski crystal is suspended on an 18-inch silver plated chain. 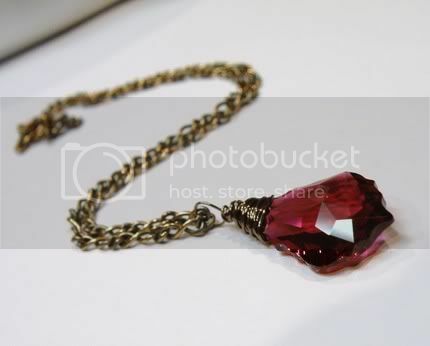 Simple and sweet, this necklace is the perfect accessory for anyone who loved Bella's prom outfit! 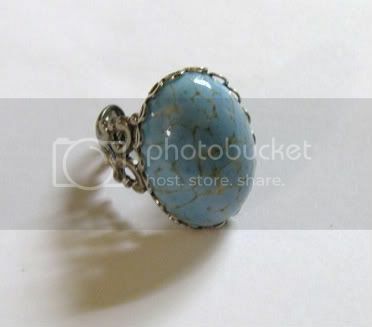 Looking for Bella's Moonstone Ring or her Turquoise Bracelet? They are available in my shop! This absolutely lovely handmade bracelet was inspired by the always overcast, misty, stormy weather that provides the setting for the Twilight saga. 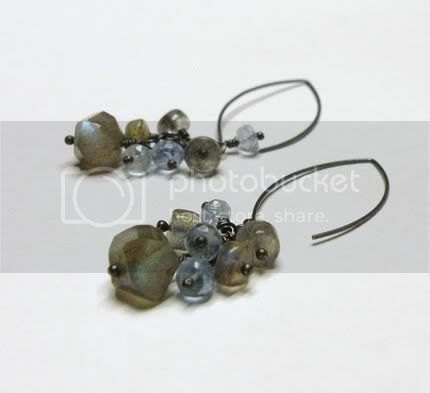 The simple, delicate design highlights a gorgeously glittery, faceted labradorite gemstone. These labradorite stones are so unique, with a speckled, softly glittery texture and flashes of blue and green. The handcrafted sterling silver bracelet is the perfect size - neither too large or too big, it's simple enough for every day wear and dresses up gorgeously! Keep your eyes out over the next few weeks for the rest of my "In the Mist" line. 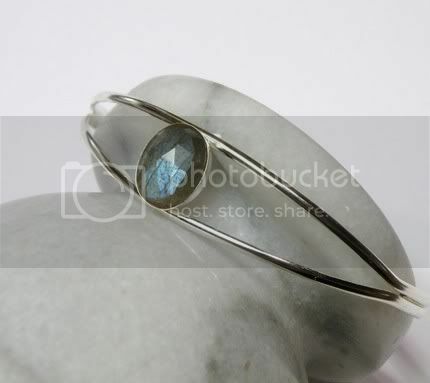 The gemstone measures 12mm at the tallest point. The bracelet itself is made of solid sterling silver and is adjustable with firm, gentle pressure, so that you can find your perfect fit! Please note that no two labradorites are alike! Each stone has its own unique markings and flashes of color. So, in a way, each bracelet becomes one of a kind. :) I've only used the most beautiful, flashy stones for this design! Understated elegance... These gorgeous earrings have been staples in my wardrobe since last winter! 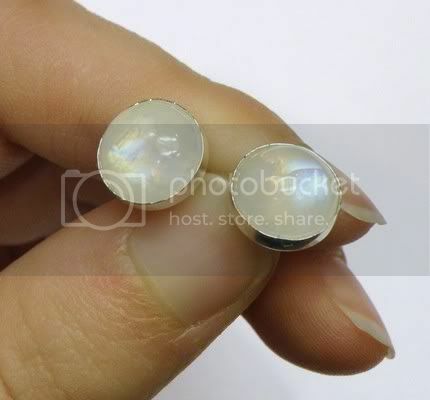 Two gorgeous, high quality, flashy rainbow moonstones are set in sterling silver handmade posts. Their sterling silver backings have a comfort cushion for easy, pinch-free wear all day long. It's gemstone earring perfection. You'll never want to take them off! These beautifully simple post earrings are NOT itty bitties! 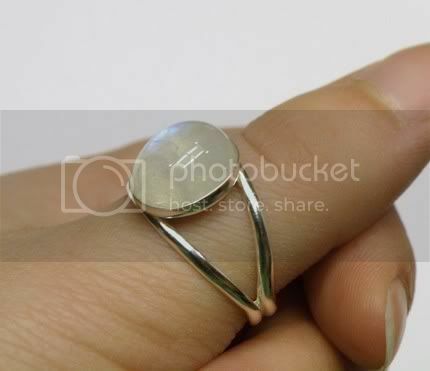 They are smaller than my Bella Ring moonstones, but still measure just over 10mm. Flattering and gorgeous, the glow of these earrings is sure to draw attention up to your lovely eyes! Green leaves and cold, hard ice. 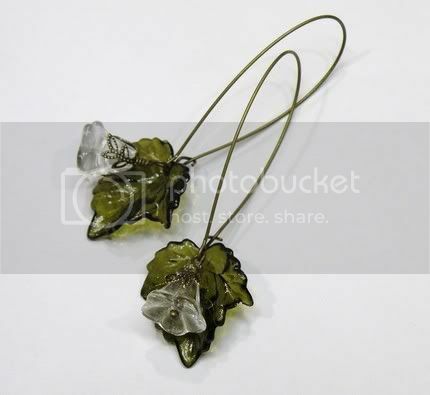 These beautiful earrings were inspired by the green, frosty environment of the Olympic Peninsula. 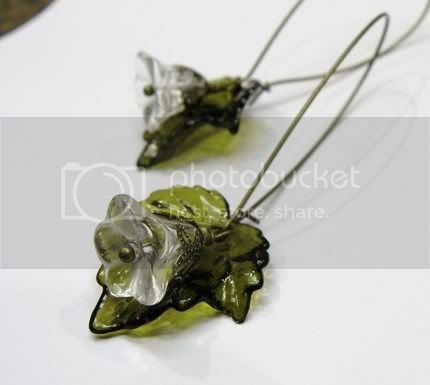 Transluscent lucite leaves (like too-green Forks) each dangle behind an icy clear glass flower (cold and hard like Edward), that represents the bloom of Edward and Bella's relationship together. The lovely pair hang on elongated brass earwires, and measure just under 3 inches from the top of the ear wire to the bottom of the leaves. Gorgeous! This is a Limited Edition design - they won't be around forever, so if you love them grab them while you can! Inspired by the glamorous and eternally chic Alice Cullen, this gorgeous ring feautures a lovely, vintage West German glass turquoise piece set in a stellar vintage filigree ring. Old and stylish, just like Alice! 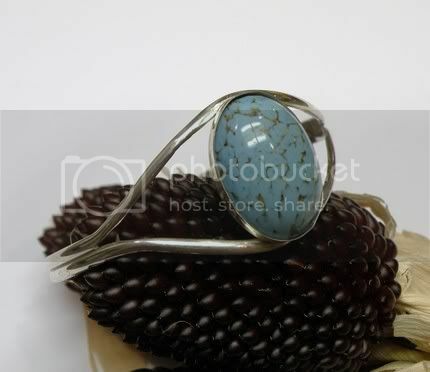 One of the most popular BB items, this ring goes with everything! The vintage filigree is adjustable with firm, gentle pressure, so you can customize the size for your perfect fit. Leave your ring size in the box below, and we'll even send your ring sitting at the right size for you. Made entirely with vintage supplies, this ring won't be around forever. Get this lovely while you can! Welcome to the home of the very first Bella-inspired turquoise bracelet! 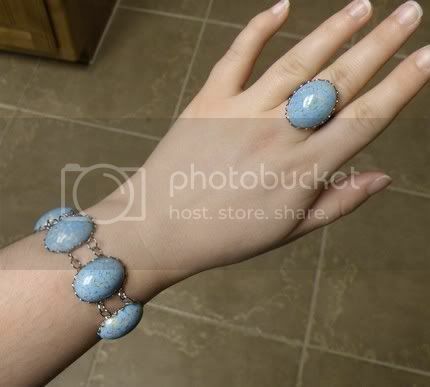 First sold before the Twilight movie opened in 2008, the BellaBejeweled Turquoise bracelet with vintage West German Glass has become a staple in the Twilight community. This gorgeous bracelet is handcrafted out of solid sterling silver (stamped .925), and set with an absolutely lovely piece of vintage West German Glass Turquoise. These fantastic pieces come mostly from the 1950's and give this simple, chic bracelet a little vintage charm. As these are genuine vintage West German pieces, supply will eventually run out. Order now while you still can! High quality, handmade to last for generations, the cuff bracelet is made to be slightly adjustable, so that with gentle pressure you can customize it for the perfect fit. You'll love wearing it! From the creator of the ORIGINAL Bella moonstone ring inspired by Twilight, let's welcome the newest addition to the BellaBejeweled rainbow moonstone line - an oval Bella Ring! 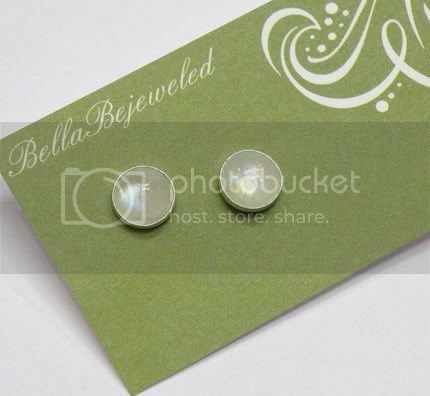 The original BellaBejeweled Bella Ring (which holds a gorgeous, round rainbow moonstone) is the most popular Bella Ring online. A stunning piece loved by thousands of customers, the original BB Bella Ring is one of my all time favorite pieces of jewelry! Every now and then, I get a custom request from a client who loves the Bella Ring, but prefers to wear oval shaped stones. 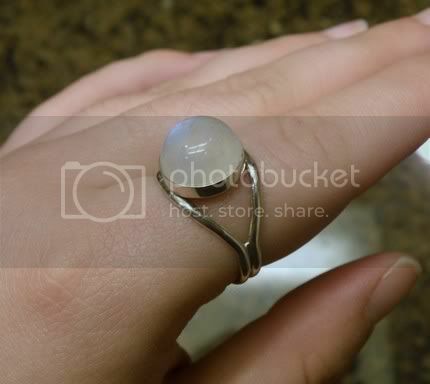 Every single custom order made with an oval stone has turned out so beautifully, I finally had to have one for myself. And who am I to be stingy with jewelry?? We debuted the oval Bella Ring at TwiCon with fantastic results, and I'm happy to bring it here to share with you now! Each oval Bella Ring is handcrafted out of solid sterling silver (stamped .925), and holds a gorgeous, flashy oval rainbow moonstone. Our incredibly flashy rainbow moonstones are custom cut at the mine especially for BB - you can't get these beauties just anywhere! Best of all, we offer an adjustable version that is just as lovely and high-quality as any other solid sterling silver ring. Just a little gentle pressure will allow you to customize your ring for the perfect fit! Made with exclusive supplies and lots of love, you can only get this gorgeous design here at BellaBejeweled. ~ Why adjustable? ~ My exclusive design allows the ring to be adjusted with gentle pressure, but is comfortable to wear and won't pinch or snag. I chose to make the ring this way because many of us like to change which finger we wear rings on, but not all of our fingers wear the same size. When giving a gift, we may or may not know the size of the person receiving. It's the best of both worlds - the best in quality AND flexibility! Want the ring with a customized sized band instead? Not a problem! We can make your ring in any size (half or quarter sizes are ok too!). Just specify in the menu below whether you'd like adjustable or sized, and your ring size in US sizing. We'll take care of the rest! 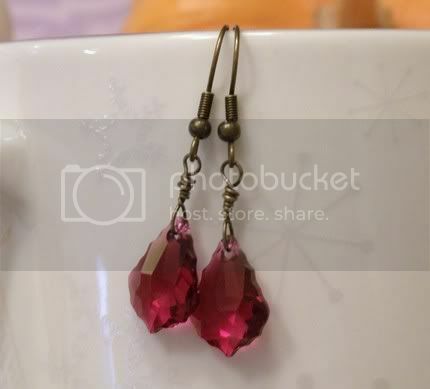 Absolutely gorgeous baroque Swarovski drops in deep red are wire wrapped to antique brass ear wires. So sparkly and beautiful! I love this unusual cut in the Swarovski crystal line. These classic yet unique dangles became staples in my wardrobe almost overnight. Old fashioned, rich, and decadent, they're the perfect accent this holiday season! For the complimenting necklace, click here. 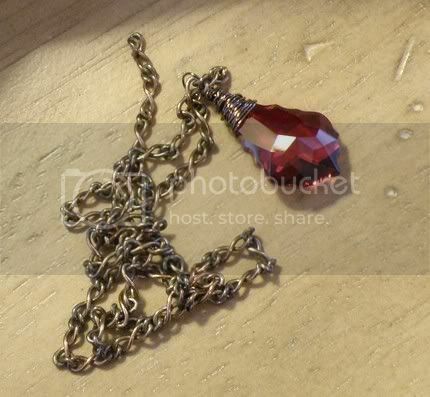 An absolutely gorgeous baroque Swarovski drop in deep red is wire wrapped to unique vintage brass chain. So sparkly and beautiful! I love this unusual cut in the Swarovski crystal line. Old fashioned, rich, and decadent... it's the perfect vintage accent for any occasion! Wishing for the drop in a different color? All you need to do is ask! 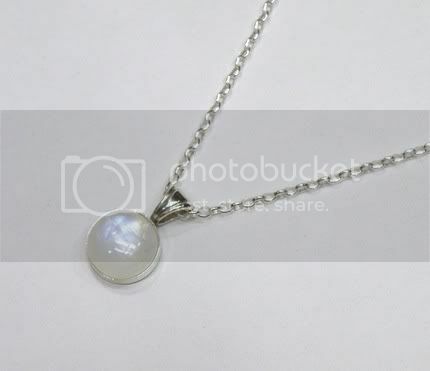 Bella Moonstone Necklace - As Seen In the BCP Music Video, Safety First! The Safety First music video from the Bella Cullen Project premiered at TwiCon just before the Twilight Movie Screening. 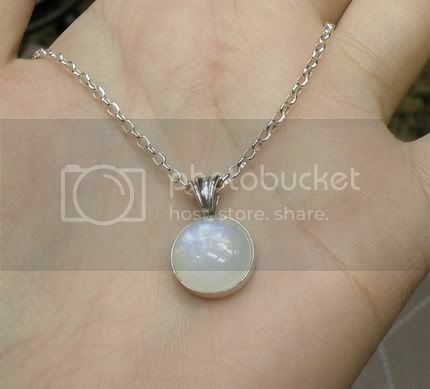 Watch the video to see Bella wearing the BellaBejeweled Moonstone Necklace in nearly every scene. Wow! Originally created just for me and a few friends, I just can't keep this sweet Bella-inspired necklace a secret anymore! 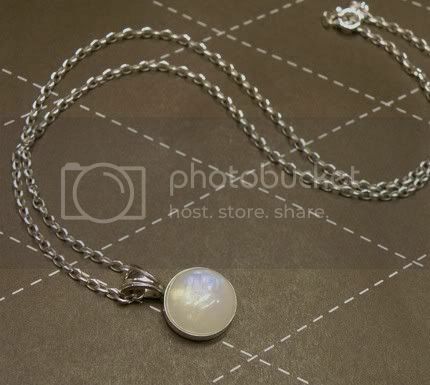 Using one of the stones that was custom-cut for my Bella Ring project, I designed this simple necklace to highlight the beauty of the Rainbow Moonstone at the center. The handmade pendant with a beautifully set stone hangs on an 18-inch sterling silver chain. 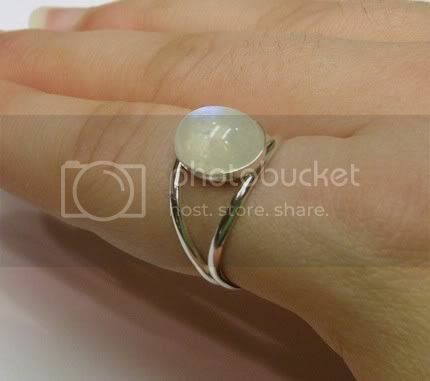 Simple and chic, it looks gorgeous alone, or when complimented with your Bella Moonstone Ring! 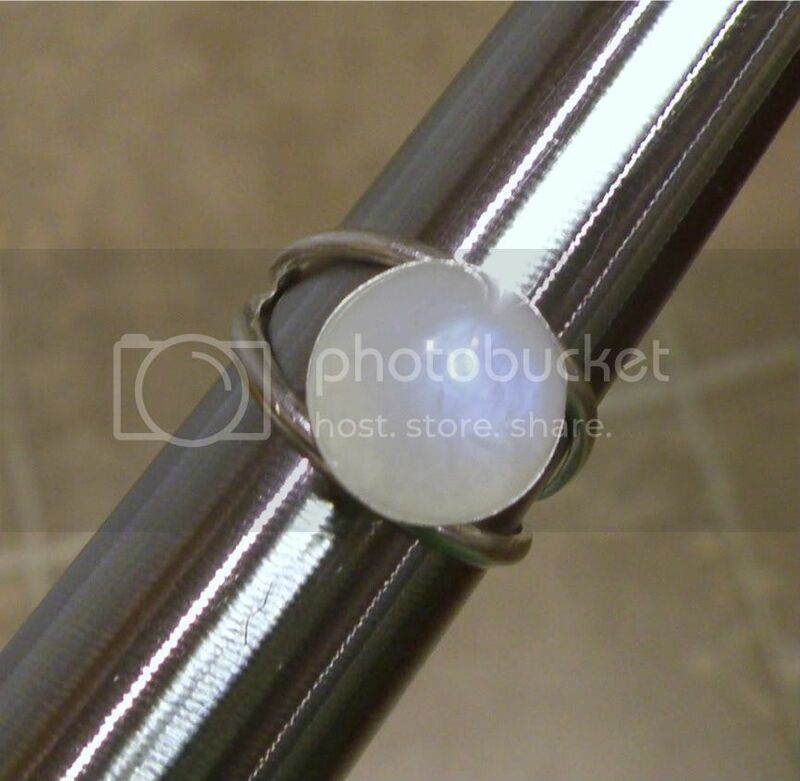 Welcome to the home of the very first Bella-inspired rainbow moonstone ring! BellaBejeweled introduced this ring to the online shopping scene over a year ago, and this super popular BellaBejeweled Bella Ring has only risen in demand since then. 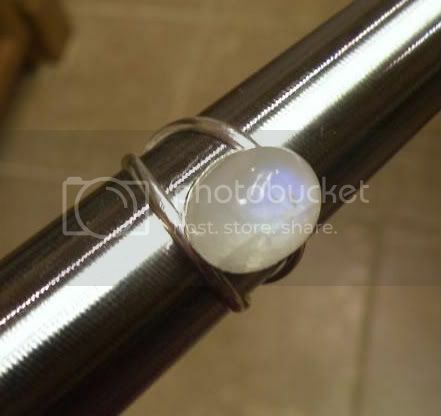 This beautiful ring is handcrafted out of solid sterling silver (stamped .925), and holds a high quality round Rainbow Moonstone gem at the center. 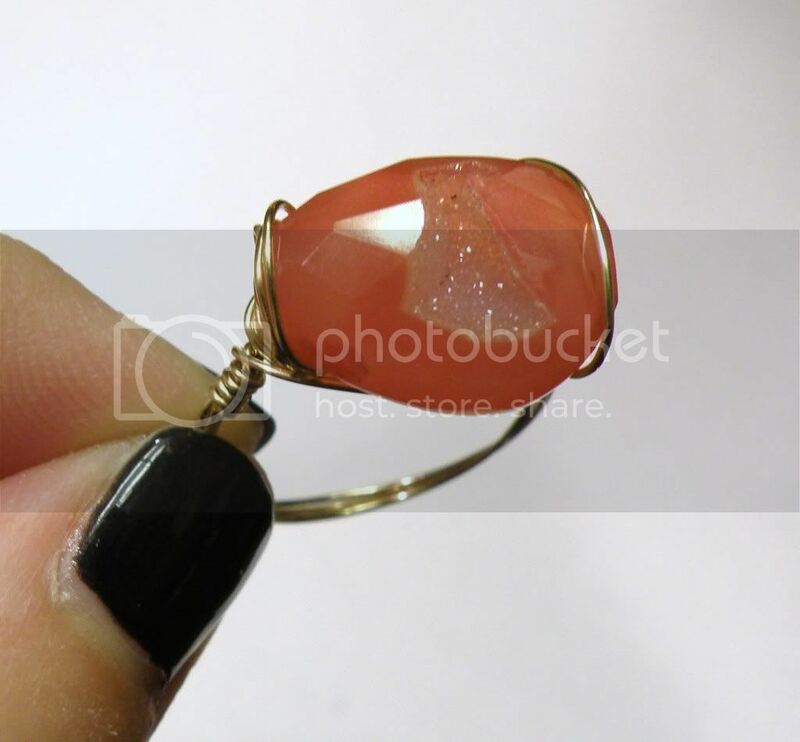 These gemstones are cut at the mine especially for our shop, to our exact specifications. You can't get these beauties just anywhere! Best of all, we offer an adjustable version that is just as lovely and high quality as any other solid sterling silver ring. Just a little gentle pressure will allow you to customize your ring for the perfect fit! Made with exclusive supplies and lots of love, you can only get this gorgeous Bella Ring here at BellaBejeweled. ~ Why adjustable? ~ My exclusive design allows the ring to be adjusted with gentle pressure, but is comfortable to wear and won't pinch or snag. I chose to make the Bella Ring this way because many of us like to change which finger we wear rings on, but not all of our fingers wear the same size. 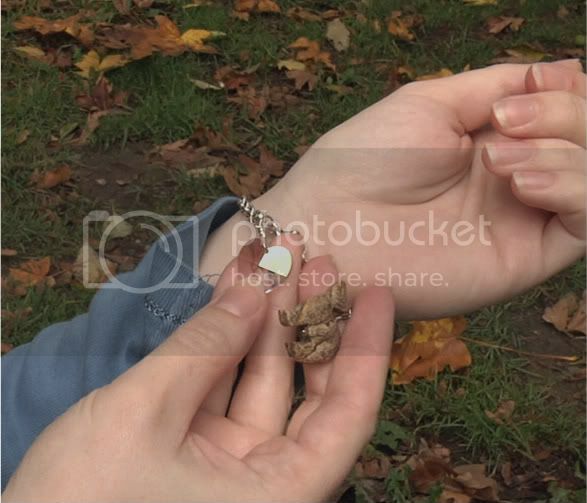 When giving a gift, we may or may not know the size of the person receiving. It's the best of both worlds - the best in quality AND flexibility! Want your ring with a customized sized band instead? Not a problem! We can make your Bella Ring in any size (half or quarter sizes are ok too!). Just specify in the menu below whether you'd like adjustable or sized, and your ring size in US sizing. We'll take care of the rest! Welcome to BellaBejeweled, your one stop shop for beautiful and unique artisan jewelry. We're glad you're here! At BellaBejeweled we celebrate the creative process, and this passion can be seen in every product we offer. Everything you see here is handmade with the utmost care and attention to detail, because our goal is to bring you the BEST in quality artisan jewelry. We stand by our pieces, and every piece of jewelry from BellaBejeweled comes with a Lifetime Quality Guarantee. Many of the items are limited edition or one of a kind, but you can also check out our Classics section for the pieces that have become a permanent fixture in the BB line. The BellaBejeweled family is always growing! You'll find trendsetters wearing BellaBejeweled in every major city in the US, as well as in 38 countries worldwide (and counting)! For a complete list, check out the artist bio on the left hand side of the screen. We're always mindful that it's because of YOU that this crazy ride is possible. Thank you so much for the patronage and support that makes BellaBejeweled a reality! Sit back, take a look around, and drop us a line if you feel like it. Hopefully you'll find something here that will become a cherished part of your wardrobe for years to come. Just a few of the places you may have seen BellaBejeweled! 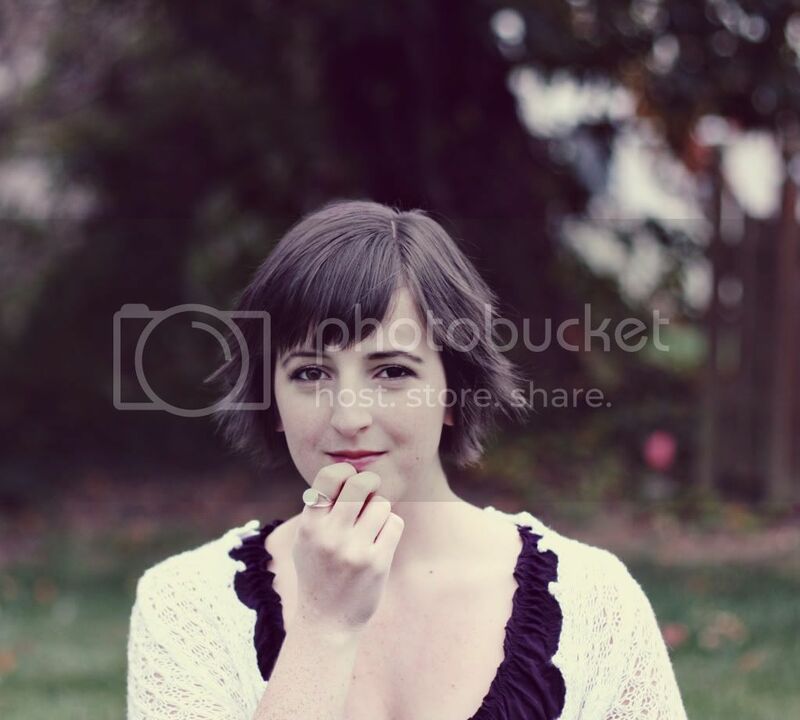 Check out BB's Bella Ring, featured on Coolspotters! For a complete list of Press for BellaBejeweled or for Press inquiries, click here or send us an email! All products sold by BellaBejeweled are not intended for children under the age of 14. Blog Design by Lady Ambrosia All content Copyright © 2008-2010 BellaBejeweled, except where stated otherwise.